Lajes Field is a Portuguese Air Base, located on the island of Terceira. The nine inhabited islands of the Azores archipelago are located in the North Atlantic Ocean, about 2,300 miles east of Washington, D.C. and about 900 miles west of Lisbon, Portugal. Together, they form an autonomous region of Portugal. Lajes Field, known as the "Crossroads of the Atlantic," provides an important mid Atlantic link for US and allied forces to Europe, Africa and the Middle East. 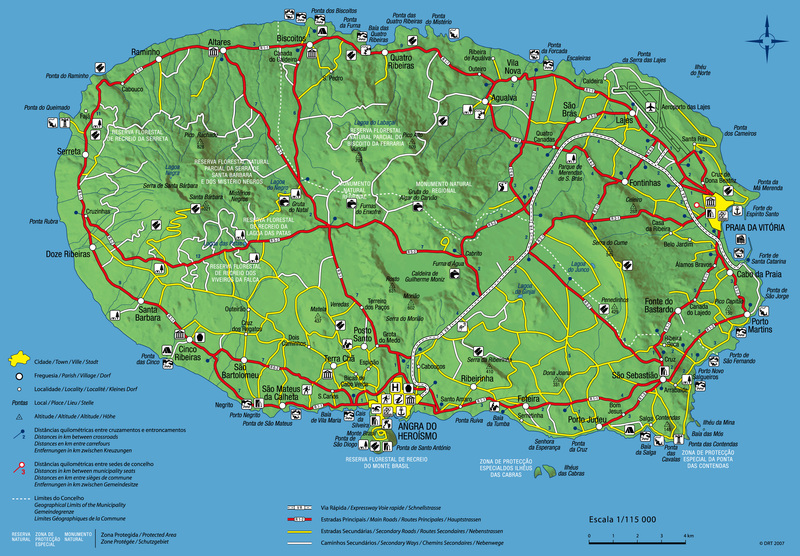 The volcanic origin of all the islands is revealed by their volcanic cones and craters. Pico, a volcano that stands 7758 feet high on the island of the same name, has the highest altitude in the Azores. The nine islands of the archipelago are divided in three Groups: The Eastern Group of São Miguel and Santa Maria; the Central Group of Terceira, Graciosa, São Jorge, Pico and Faial, and the Western Group of Flores and Corvo. 1934-The Portuguese Army began construction of Lajes Field 1943-During WWII, Its strategic location enabled British and American airplanes to protect Allied shipping in the mid-Atlantic and cut flying time between the United States and North Africa from 70 to 40 hours 1946-The United States and the United Kingdom transferred control of Lajes back to Portugal. A temporary agreement was reached giving the U.S. military rights to Lajes Field for an additional 18 months 1949-Portugal joined the NATO military alliance; the use of Lajes was their primary contribution to the strength of the Alliance Present Day-Lajes Field remains Portuguese Air Base 4; The U.S. military resides at Lajes under tenancy status. United States Air Force Europe (USAFE). The medium of exchange on Lajes Field is the US dollar. Local currency is the European Euro. The rate changes each business day and is affected by the US dollar’s strength in foreign money markets. Euros are available for purchase at the Top of the Rock Commons (TORC), and the two ATMs and banks located in the Portuguese terminal. Commercial taxi service is plentiful and relatively inexpensive. A typical ride into the port of Praia costs approximately $7 and a trip to Angra is about $18. Ask the driver in advance to negotiate the price. Call 295-512654, 295-512092, or 295-512151 for commercial taxi pick-up. The dispatcher will give you the license plate number of the taxi that will come for you. There are many restaurants in the Lajes vicinity which feature excellent Portuguese food at reasonable prices. Most restaurants have an English menu. You may also wish to ask any of our permanent party personnel for recommendations of local eateries. It’s recommended that you don’t eat butter or cheese that is not in sealed individual packets. Uniforms are not to be worn off base or outside of vehicles in accordance with our host nation agreement. This includes even quick convenience stops. The only exception to this rule is to pay a phone bill, water bill, electric bill, rent and those attending official functions at the golf course. High winds in excess of 50 knots (57.6 mph) are common. Wind warnings are announced through AFN radio and television programming. When wind warnings are in effect, stay inside as much as possible, keep curtains drawn, and be alert for flying objects when you must venture out of doors. Be especially careful when opening and closing doors to buildings and cars.